Deb's Cup of Tea: Just ewww. This is a weird photo. I admit that. I have one of those plastic containers on the bathroom shelf that contains Q-Tips. I got down to my last dozen so I got out the box that was under the sink. What you see to the left is what I found. If you notice, some of the Q-Tips are missing ends. I was quite startled and started tossing them out. As I dug deeper into the box and realized over half of the Q-Tips were missing ends, I noticed those black flecks in the bottom of the box. Close examination shows those to be insect shells. 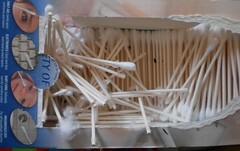 Some kind of insect had infested my extra box of Q-Tips and had eaten off the cotton swab ends of most of them. You can see a few that are okay but who is to say there isn't larva in those swabs. I pitched the whole box and it will go out to the curb tonight with the garbage. I have never seen this before. I have no idea what those bugs could be. I thought of cotton weevils but how did they get into my Q-Tips? That's the part that really bothers me. Is this larva that's naturally occurring in cotton and I put this in my ear? [deep breath] No, no. I'm going to operate on the assumption it's something that got into the house. I have to replenish my Q-Tips because I use them for a lot of things. I guess what I need to do is not buy the gigantic economy size if I can't get them into the plastic bin I have. Has anyone else had this problem? Any guesses what the bugs are? It's creepy. Someone should make a low grade horror movie out of this.